From a purely historical perspective, St. Pius X is a most interesting and intriguing character. He was also a very controversial pope whose actions are hotly contested to this day. No doubt this is due to his pivotal and providential role in what has become known as the Modernist crisis or heresy. "I was born poor, I have lived poor and I wish to die poor." He was elected pope on the morning of August 4th on the fifth ballot after a controversial conclave that witnessed the intervention of a veto on behalf of the Austro-Hungarian Emperor thereby depriving Cardinal Rampolla of the papacy. The program of the new pope was evident in his choice of motto—to restore all things in Christ. In his first encyclical two months after his election he made very clear the essential direction and deep motivation of his Pontificate: "We champion the authority of God. His authority and commandments should be recognized, deferred to, and respected." I do not think there is a great hope to be nourished for Catholicism, nor that anything can be attempted under the Catholic label. …If humanity is to arrive one day at a kind of religious unity, it will probably not be in the profession of one of the actually existing religions but in the universal consciousness of human dignity, of human right, of human solidarity, in the most elevated sense of these words, that is to say, in a new ideal which will not be imposed from without like the revelation of an absolute personality superior to the world, but which will be the consciousness of a humanity at last able to lead itself and to see God face to face as is related of Moses." This statement is but one of the many poisoned fruits produced by Modernism. In the time of St. Pius X, this heresy was only partially uncovered and temporarily checked. Undefeated, it has re-emerged in full vigor and now virtually dominates the Catholic world. "Liberalism in religion is the doctrine that there is no positive truth in religion, but that one creed is as good as another. …It is inconsistent with any recognition of any religion as true. It teaches that all are to be tolerated, for all are matters of opinion. Revealed religion is not a truth, but a sentiment and a taste, and it is the right of each individual to make it say just what strikes his fancy." Already we discern in vitro the child to be delivered during the Second Vatican Council. The ideas at the heart of Liberalism and Modernism found their way into the Council and flourished in the heady aftermath of its application and interpretation. Despite the best efforts of a saint pope and his collaborators, heresy rose to the fore and continues to influence so many key figures of the Church at all levels. 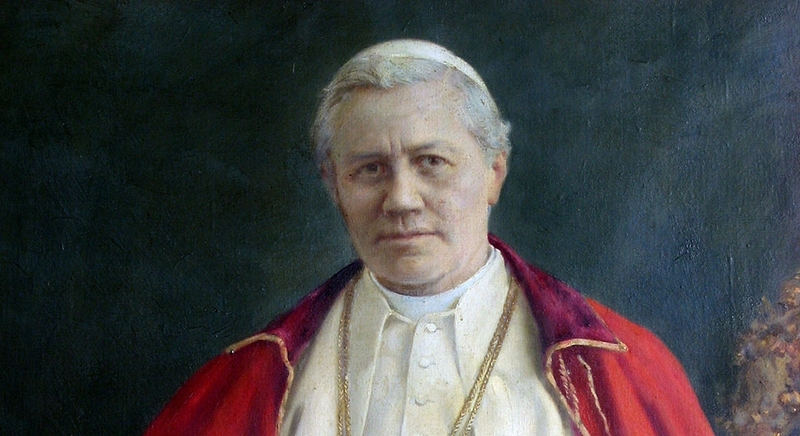 St. Pius X is also the pope responsible for the initial reform of the Church's law which brought forth the 1917 Code. He is the pope who championed daily Communion for the faithful as well as promoting a renewal of Gregorian chant. Pope Sarto died on August 20, 1914, the very day German forces marched into Brussels. War was very close, and its imminent approach greatly saddened Pius X who suffered a severe heart attack from which he would not recover. He was canonized in 1954, 40 years after his death. In all, four miracles were cited in his cause for canonization. He was one of those chosen few men whose personality is irresistible. Everyone was moved by his simplicity and his angelic kindness. Yet it was something more that carried him into all hearts, and that something is best defined by saying that all who were ever admitted to his presence had a deep conviction of being face to face with a saint." 2 On May 12, 1879, Dr. Newman went to the Palazzo della Pigna to receive there the messenger from the Vatican bearing the biglietto from the Cardinal-Secretary of State, informing him that in a secret Consistory held that morning His Holiness had deigned to raise him to the rank of cardinal. Soon after midday the consistorial messenger was announced. He handed the biglietto to Dr. Newman, who, having broken the seal, gave it to Dr. Clifford, Bishop of Clifton, who read the contents. The messenger having then informed the newly-created cardinal that his Holiness would receive him at the Vatican the next morning at ten o'clock to confer the biretta upon him, and having paid the customary compliments, His Eminence replied in what has become known as his "Biglietto Speech". First pope to have been canonized since the late 16th century.